Manchester United produced a vintage European display to move joint-top of Europa League Group A with a scintillating 4-1 victory over Fenerbahce. With Crystal Ball securing a corporate membership at Manchester United's Executive Club for the 16/17 season, this provided a unique spectator experience for our highly valued customers at the Manchester Utd v Fenerbahce Europa League game. With champagne and canapes on arrival followed by a 4 course a la carte menu and unlimited beverages, Crystal Ball's Business Development Manager; Jonathan Morgan invited customer's Ian Benison (SLIC Training Ltd), Paul Rowden (Heart Of England Co-operative) and Patrick Dowling (Dowling Civil Engineering Ltd) to sit back and enjoy the game. 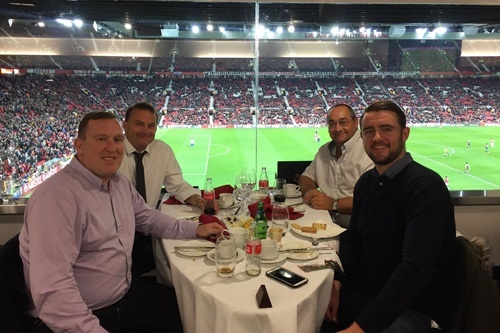 All 4 enjoyed the game and hospitality from within Old Trafford's famous Stretford Suite overlooking the pitch. A brilliant evening was had by all with great food and company, drinks flowing and a victory for Man Utd. We look forward to inviting and treating more customers at Man Utd with the next home game being Manchester Utd vs Manchester City, October 26th.